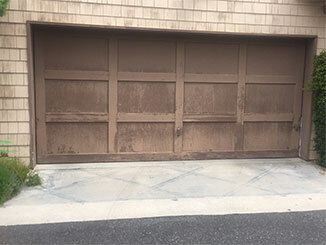 Home Our Garage Door Services Garage Door Maintenance Should I Paint My Garage Door? Modern overhead doors are made to be elegant, reliable, strong and long-lasting. Still, you can't expect any kind of mechanical system to function properly and to remain in good condition without the appropriate maintenance. This is especially the case when the door is regularly exposed to the elements. One of the main questions is how to protect your panels from the adverse impact of the natural environment. Is the use of paint necessary? The first factor to consider when deciding whether to use paint on your door are the recommendations set by the manufacturer. Many steel models sold at present do not have any kind of protective layer when they're released from the manufacturing facility. This means they'll be at greater risk of corrosion when exposed to rainwater, snow, and moisture. In such cases, the painting of the panels is essential for avoiding serious damage. Is Your Door Made From Wood? Wood doors often come unpainted, leaving the choice of color and other paint specifications to the customer. Wood panels also require protection as they can become filled with water and decay. Painting is often recommended for wood and sheet metal panels but the choice of paint again depends on what the manufacturer requires. Keep in mind that if the product you choose doesn't meet these requirements, any warranty you might have may be breached. Usually, manufacturers require the use of exterior-grade paint which is based on latex rather than oil for steel doors. Wood structures often require paint specially made for this type of material. Again, you must get an exterior-grade product and we recommend getting the panels painted soon after installation. Are There Better Protective Options? While paint is the obvious choice for protecting panels, in some cases a thicker and stronger material is recommended. For coastal areas and areas prone to large variation in terms of temperature, plus extreme weather events like blizzards, wax might be a better option for steel panels. For wood panels, you'll likely need several coatings of stain and of varnish. It is crucial to recoat your door on a fairly regular basis, we recommend re-painting on an annual basis and for complete protection, install top, side and bottom seals.